In the past week a ratty Ghia, a Fiat Abarth Zagato in need of restoration, a De Tomaso Deauville that needs to be reassembled and now a neglected Abarth 2200 Allemano Coupe have all shown up on eBay. For a person like me, who loves all things Italian, it's almost too much to deal with. The seller starts his eBay listing with this sentence... "This Abarth 2200, featuring aluminum coachwork by Allemano, was purchased off of the floor at the 1962 Turin Auto Salon by Briggs Cunningham for his wife who promptly rejected the gift after the car was already imported to New Jersey." I've never seen one of these before. There's a really good reason for that, as the seller goes on to state, "the only other similar coupe in existence remains in a museum in Italy after it was originally owned by Carlo Abarth’s wife". (Mrs. Abarth apparently didn't reject hers). The seller has had this car in his possession for the last 20 years "but (it) has been somewhat neglected as it needs electrical sorting and exterior freshening". The Abarth tuned 2.2 liter I6 puts out 140 HP, which I assume makes it a very quick car (I could not find any performance specs for this car). Being 1 of 2 made and having some Briggs Cunningham history, I suspect the reserve is very high for this car. Somebody needs to buy it though. Having been rejected and neglected, it's time for this car to get the attention it deserves. 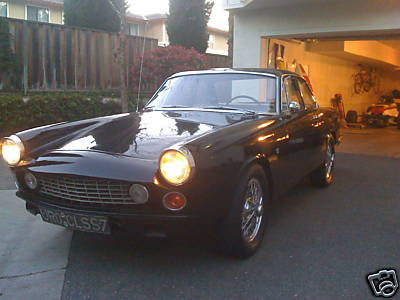 Click here to see the eBay listing for this incredibly rare and interesting car. Other than buying it for his wife, Briggs Cunninham (who passed away in 2003 at age 97) had little to do with this car, but he's an important and interesting figure in the world of auto racing. Click here to see the Briggs Cunningham website. Carrozzeria Allemano began in business in 1928 and closed its doors in 1965. One of the lesser know Italian design houses, it nonetheless designed and built some interesting cars. There is little written about them, but you can find a brief Wiki article about them here.